Danielle McEwan, United States, fired games of 258 and 266 scratch and added eight pins women’s handicap each game to fly past Yousif Falah of Bahrain, 540-416, to win the World Bowling Tour’s H.H. Emir Cup 2016 Wednesday afternoon at Qatar Bowling Center in Doha, Qatar. 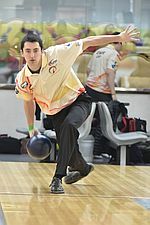 McEwan, who improved on a third-place finish last year, used a six-bagger from frame 5 to take a 42-pin lead after the first game. After she sandwiched a strike between two spares to open game two, the winner of the 2015 Women’s World Bowling Tour finals reeled off eight consecutive strikes to put the match away well before the final frame. In a close semi-final match, third-seeded McEwan doubled in the 10th frame of the second game to eliminate No. 2 seed, Daphne Tan of Singapore, 435-422. Falah, who took the last spot for the playoffs in the third eight-game round, stunned top-seeded Marshall Kent, who was looking for his second PBA title, 498-361. 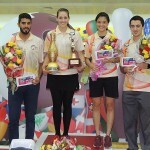 McEwan received the 20,000 Dollar for winning her first World Bowling Tour title, Falah pocketed $12,000 for second place, while Kent and Tan got $6,000 apiece for third and fourth place, resp. Though McEwan is a PBA member she does not get credit for a PBA title because she used the handicap pins. The H.H. Emir Cup 2016 was the first tournament on the 2016 World Bowling Tour and an Asian Bowling Federation Tour ranking tournament, the opening event on the 2016 season. 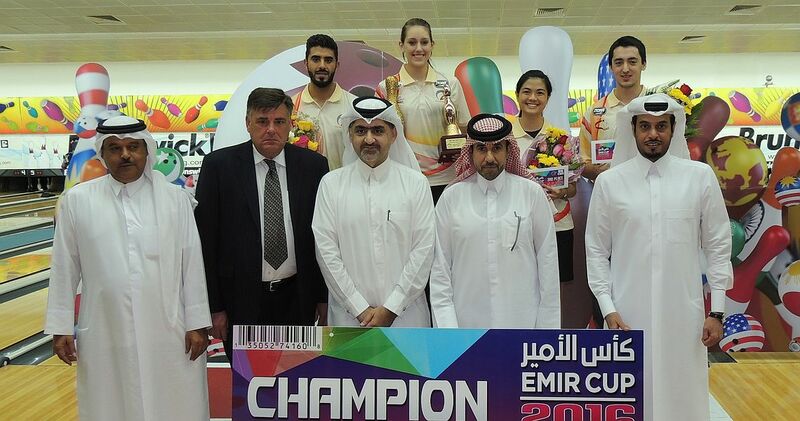 The Emir Cup was held from February Feb. 25 through March 2, 2016 at the Qatar Bowling Center, a 32-laner in Doha, Qatar. Players competed for total prize money of US$102,000 with $20,000 going to the winner, $12,000 to the runner-up and $6,000 each to the third and fourth place finishers. According to an agreement between World Bowling and the Professional Bowlers Association (PBA), the Emir Cup will award a PBA title in a WBT event, if won by a PBA member. Qualifying ran over five days featuring three squads (A, B and C). Each squad bowled two eight-game blocks. Women received eight pins handicap each game, an equality handicap provided to women in many World Bowling Tour events. Total 32 players including the top 25 players after 16 games plus the next three Qatari bowlers and the top four players from the Desperado Squad advanced to the finals on March 1 and 2. The top 4 qualifiers earned two byes while qualifiers 5-8 got a first-round bye. The other 24 players bowled 8 games scratch with the top 12 advancing to the next round. Those 12 and qualifiers 5-8 rolled another eight-game block scratch to cut to the top 8 who joined the top four qualifiers in the third eight-game round from scratch. The top four players advanced to the playoffs. The No. 1 seed met the No. 4 seed and the No. 2 seed took on the No. 3 seed over two games with the total pin fall to determine the winners, who bowled for the title and the $20,000 top prize in the two-game total pins championship match. The top 16 Asian finishers will be awarded Asian Bowling Federation (ABF) Tour ranking points. The next stop of the 2016 World Bowling Tour is the 14th Kingdom of Bahrain International Open, which will be held from March 4-9 at Ozone Entertainment Center in Sitra, Bahrain. Championship: McEwan (266, 274) def. Falah (224, 192), 540-416. * Tan and McEwan received eight pins handicap per game.